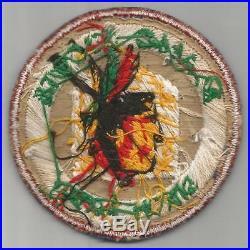 Read Discription Luzon Made WW 2 US Army 6th Army Alamo Scouts Patch Inv# JR682. A Filipino-made version of the Alamo Scouts patch constructed on Luzon in mid-1945. This Patch has a notarized letter of authenticity and sale from the son of one of the team leaders. The back of this patch brightens under a UV light but does not glow like newer materials. This patch, like everything else I sell, is 100% guaranteed original. Please use image super sizer for the best view. You get the item pictured, we do not use stock photos or other sellers images. All items are guaranteed to be 100% original, we do not sell reproductions. All items are for sale here and in my walk in store. Walk in sales take priority. Pay for the item within 3 days of invoice. Get Supersized Images & Free Image Hosting. Create your brand with Auctiva's. Attention Sellers - Get Templates Image Hosting, Scheduling at Auctiva. 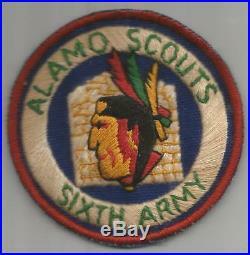 The item "Read Discription Luzon Made WW 2 US Army 6th Army Alamo Scouts Patch Inv# JR682" is in sale since Monday, March 11, 2019. This item is in the category "Collectibles\Militaria\WW II (1939-45)\Original Period Items\United States\Patches". The seller is "worldwarpatches" and is located in Sierra Vista, Arizona.